The Asus ZenBook Pro 15 UX580 is designed for the discerning user and anyone looking for maximum mobility and outstanding performance from theinrotebook. In the light and slim aluminum housing, the Pro combines everything that high-end mobile computing needs. These include the latest Intel Core Hexa-Core processors, GeForce GTX graphics and up to 8 hours of battery life with fast charging function. Most importantly, the ZenBook Pro 15 UX580 is the world’s first notebook to integrate an innovative second display with the Asus ScreenPad. The ZenBook Pro 15 UX580 is an absolute world first with the ScreenPad, a unique user interface on board, which can also be used as a second native Windows 10 supported display. Media control, app launcher, shortcuts for Microsoft Office applications, a calculator, smartphone functions and much more can easily be faded in on the 5.5 “FHD touch display, interactively configured and used intuitively. Particularly handy is the screen extender mode, which turns the ScreenPad into a fully fledged second display. 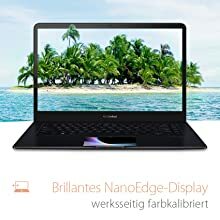 YouTube, a game, another window – any productivity and multimedia content can be viewed flexibly in the ScreenPad just as if you had connected a second monitor. 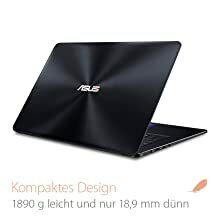 The ZenBook Pro 15 is 18.9 mm thin, 1890 g light and is made entirely of aluminum in elegant Deep Dive Blue color due to elaborate manufacturing technology. Despite the large 15.6 “display, the UX580 is as compact as a conventional 14-inch notebook. The ZenBook Pro 15’s wide-view display is designed to accurately reproduce large color spaces (4K model: 100% Adobe RGB, FHD model: 100% sRGB), and extremely accurate details. The low Delta E value (4K model: <2; FHD model: <3) ensures that colors are rendered with high accuracy. Ideal for photo and graphic professionals. 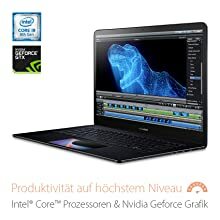 Equipped with 8th generation Intel Core processors, high-performance i9-8950H hexa-core, NVIDIA GeForce GTX 1050 Ti graphics, plenty of memory and up to 1 TB PCIe x4 SSD, the ZenBook Pro 15 delivers excellent productivity and more than enough power graphics-intensive tasks. The ZenBook Pro 15 is equipped among other things with two USB 3.1 type C / Thunderbolt 3 ports. 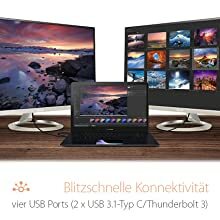 Data transfers with up to 40 GBit / s are just as possible as the connection of two external 4K monitors. AC-WLAN and Bluetooth 5.0 enable lightning fast wireless connectivity. The laptop with Two screens is Asus Zenbook Pro 15 ux580ge is launched in india recently 2018. The Asus ZenBook Pro 15 UX580 is designed for the discerning user and anyone looking for maximum mobility and outstanding performance from their notebook. In the light and slim aluminum housing, the Pro combines everything that high-end mobile computing needs. These include the latest Intel Core Hexa-Core processors, GeForce GTX graphics and up to 8 hours of battery life with fast charging function. Most importantly, the ZenBook Pro 15 UX580 is the world’s first notebook to integrate an innovative second display with the Asus ScreenPad.